The global electric car stock, primarily composed of Battery Electric Vehicles (BEVs) and Plug-in Hybrid Electric Vehicles (PHEVs), surpassed 2 million units in 2016. This is up 60% from 2015, indicating rapid market evolution. Electric Vehicles (EVs) have the capacity to increase energy efficiency, diversify transport energy carriers, and play a role in the sector's carbon emissions mitigation. 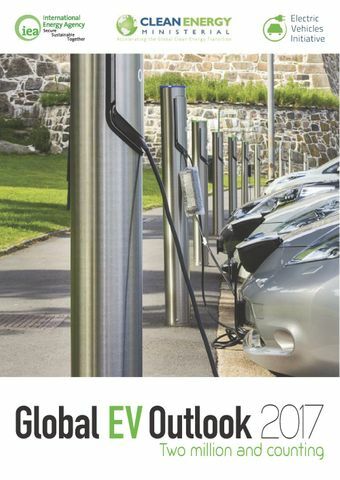 BEVs and PHEVs are also well equipped to reduce emissions of local pollutants and noise levels in high-exposure areas such as urban environments.The Global EV Outlook 2017 provides insights on recent EV technology, market, and policy developments, in particular with regards to the sector's status outlined previously in the Global EV Outlook 2016. Detailed information for the past five to ten years on EV registrations (vehicle sales), number of EVs on the road, and modal coverage across the most relevant global vehicle markets is provided. The analysis also looks at the availability and characteristics of Electric Vehicle Supply Equipment (EVSE). The Global EV Outlook 2017 reports on battery cost and energy density improvements, holding promises for further progress in EV performance and cost-competitiveness. A review and discussion of key elements on policy support for both EVs and EVSE is included, identifying policy requirements for a successful transition to mass market adoption. Finally, the report assesses the potential of EVs in CO2 emissions reduction in the transportation sector, in conjunction with requirements for successful grid integration and synergies with low-carbon, renewable electricity.